Now that green technology has been adopted by the masses, companies are quick to catch up with the supply-and-demand concept. 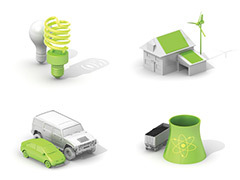 Nothing says green technology as the concept of making green dollars. There are some winners in the growth of green technology and they should be given credit where credit is due. Southern Maryland Electric Corporation just added a new 5.5 MW solar farm. 23,176 American-made solar panels make up part of this $20 million project; with the ability to generate electricity to power six hundred homes. At the height of construction, they also employed fifty five construction workers. A company that produces silicon wafers for the solar energy industry, 1366 Technologies, added a new 42,000 sq ft factory in their Bedford, MA area and they expect to hire around one hundred new employees. The City of Sacramento is working with Ygrene Energy Fund to launch a new concept called Clean Energy Sacramento. The goal is to retrofit both commercial and residential properties with energy efficient choices such as renewable energy and water conservation units. The concept will generate 1,500 jobs, add $250 million to the economic activity and add $25 million in revenue for taxes. A 75 turbine project in Gilford and Blimfield, MI has just been completed and is ready to produce electricity in sufficient amounts to power 50,000 homes. The NextEra Energy project had a cost of $250 million and the wind farm added 250 construction jobs. The Whirlpool Corporation is a company in the spotlight as they have announced that they will be prioritizing the development and production of appliances that are energy-efficient as well as save both money and energy for the consumer; while minimizing pollution and waste. A tall order to accomplish, but they have been in production since 1952, and they are now giving a big focus on green technologies. Good information. Not only are companies trying to create products that are efficient, but that they are building them in the U.S. and employing our own people. What an idea! Whirlpool now makes a majority of the appliances for everyone, just under different names. They should have been thinking about more energy efficiency a while back and what to do to recycle the old appliances. Maryland is one of those states that you never hear about. They are subdued, quiet and absolute geniuses at planning. Goes to show you gotta watch the quiet ones. Michigan has been in an economic slump for years. I am glad to see some companies other than the car manufacturers are trying to bring it back. Sacramento was always thought of as just the state capital and a bit of an old fashioned place. What a change! They are on the cutting edge of innovation and I am really proud of them for that. Ever drive through California? You are cruising along and them wham, the field and mountains open up and there are the wind farms. What a sight. It is technology and nature at it’s finest.